Currently, Ethiopia has an estimated 10.2 million people in need of assistance throughout 2016, with another 5.75 million children at risk of going hungry. Up to 2 million children are currently suffering from malnutrition, with 400,000 acute cases. The numbers are once again staggering and overwhelming, leading many to proclaim that this is evidence of “history repeating itself”. Haunting images and stark rhetoric from decades of civil war and famine during the past century still constitute a large part of Western consciousness of the East African nation. The massive mobilization of humanitarian internationalism to avert unprecedented scales of human suffering and death during the 1984-1986 period of famine in Ethiopia is within living memory for many Canadians. It was under the leadership of Prime Minister Brian Mulroney and his Progressive Conservative party that David MacDonald, former cabinet minister in Joe Clark’s government, came to don the title of “Canadian aid Coordinator for the African famine”. Mulroney also called on Canada’s UN ambassador, Stephen Lewis, to galvanize action in the world community. Canadians rose to the challenge of the African drought and famine. With stories such as “Artisans donate work to aid famine victims”, and “Canucks pledge $1.5 M”, the headlines of the press from this period are illustrative of the extent of the public’s engagement with the issue of famine in Ethiopia. Some petitioned their provincial government into focusing on “community-to-community” actions between their home province and Africa, and bolstering the potential for “sustained individual personal involvement by both Canadians and Africans”. The optimism and determination of this period in humanitarianism was clearly infectious and far reaching. And David MacDonald was entrusted with bringing to fruition the hopes of dreams of Canadians in his role, because Canadians pouring funds into the cause wanted nothing less than “visible results”. Underlying the current appeals for international aid are the historic experiences with endemic and cyclical bouts of drought and famine in the region. 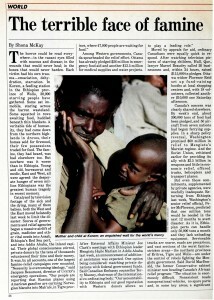 Even at the start of the new millennium, a drought in 2003 raised headlines of Ethiopians with “so little to eat”, leaving more than 11 million people vulnerable to starvation. As recently as 2009, there was an international appeal by the Ethiopian government for emergency food aid for 6.2 million people. However, within the Western mind, the 1984-85 famine year remains to be the international benchmark for the epitome of Ethiopian, and by implicit extension African suffering, and the last moment of hope for concerted effort for the permanent eradication of famine. Many are now asking how his could be happening again; why thirty years later, “things” do not appear to have not changed much within the region. It appears that in the afterglow of a concerted massive and successful international campaign, the world is still disheartened that it could not cure what ails of the region simply by throwing relief and funds at it for a short duration of time. Enshrouded in the memory of the unprecedented international response to the plight of the mid-1980s, is that in the immediate aftermath of the epic 1984-86 famine period, frontline workers were already predicting that the relief efforts delivered during the period would not be enough to abate future catastrophes from occurring. Canadian aid agencies had forewarned that even the most pressing problems faced by the people of the drought-stricken zones of Africa were not going to be overcome by March 31, 1986, when the Mulroney government had instructed David MacDonald, Canadian emergency coordinator for African relief, to wind down his work. By the tail end of the 1980s, in spite of the tremendous fund raising successes, the picture was still bleak. In December of 1987, the World Food Program was reporting that Ethiopia, Mozambique, Malawi, Angola, Somalia and the Sudan were in in of need 2.3 million tonnes of food in the coming year, totaling to approximately twice of what had been pledged by the donor countries in that time. 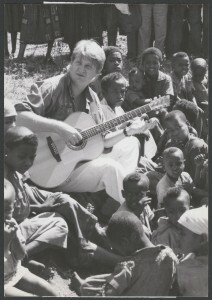 In May of 1988, MacDonald was still agitating for change in Africa in spite a month long ban on international aid workers that was crippling Canadian relief efforts from reaching the drought stricken northern parts of Ethiopia. Increasingly, the Marxist regime of President Mengistu Haile Mariam (1974-1991) was under international fire for their willful use and abuse of famine and foreign aid as a means of warfare and ethnocide during the peak of the country’s decade’s long civil war. From the start it was clear that the Ethiopian government was hostile to foreign media and determined to engage in ideological warfare to subvert the messages to the outside world. With members of the United Nations and Save the Children rallying to raise funds for Ethiopia since the start of the year, it has become clear that this time the narrative is consciously different. It is with historic resonance that such statements as “we do not see any reason why there has to be a repeat of a band-aid moment” from Ethiopian politicians deliver a politically poignant message. Moreover, Ethiopia has been receiving much criticism for doing exactly what many in the West criticize developing countries for failing to do: tackling the situation itself. However, the government has also received some praise and recognition for employing a sophisticated food security network developed since the 1984 famine. Many are in agreement that Ethiopia is now more prepared to deal with drought than in 1984; but the reality is that in some parts of the country, international help is still needed. Accusations of willful ignorance of famines on the part of the Ethiopian government did not die away with the ousting of the Marxist regime as similar criticisms of recent governments have resurfaced. In 2009, Alemayehu G. Mariam, professor of Political Science at California State University, wrote a damning article accusing the Ethiopian government under Meles Zenawi of inaction, repression, and obfuscation as major causes of the developing Ethiopian famine. Clearly, famines in Ethiopia have had a long and embattled political history, and that will continue. The degree to which any one governing body is held to be responsible for the emergent circumstances has been, and continues to be, a critical element to the construction of famine discourses surrounding Ethiopia. Thus, the centrality of the Ethiopian government in constructions of famine within the region also has strong historical antecedents. During the 1984 famine, there were widespread reports of the then-ruling Marxist regime of exploiting the famine. In particular, Berhanu Bayih, one of the country’s leading Marxist officials, was reported to have “set a new standard of ingratitude by blaming Western donor countries for the level of starvation in his drought-afflicted country”. As in the past, the current Ethiopian government is currently under fire for slow response to the drought. Widely criticized for employing “mixed messages” in their solicitation for help from the international community in this time of crisis, the Ethiopian government is trying to maintain the faith of its foreign investors in the nation’s recent unparalleled economic growth as the “Lion of Africa”. Critics within the country argue that “the government is worried about contradicting its own narrative”, which in turn would scare off foreign investors. Consequently, Ethiopian officials are reluctant to use the word “starvation” at this time, in spite of the fact that there are more than 10 million Ethiopians relying on emergency food aid to live. Arguably, the government is deliberately trying to control the narrative of this current crisis, in light of what has been characterized by Margaret Evans of the CBC as the “psychological hangover” from the previous era of famine relief. As much as the famines of the previous decades have shaped the outside world’s perceptions of Ethiopians, they have left an equally scarring and formative mark on generations of Ethiopians, both within and out of the national boundaries of the nation state. Therefore, the underlying message that some media outlets are trying to push through is that: “this is not 1984, when war and government neglect turned failed rains into famine”. With images of desperation and desolation from the epic famine of 1984-86 still looming vividly within the memories of many Canadians, alarm bells for yet another severe bout are not yet being met with the urgency and fervor that they once were. 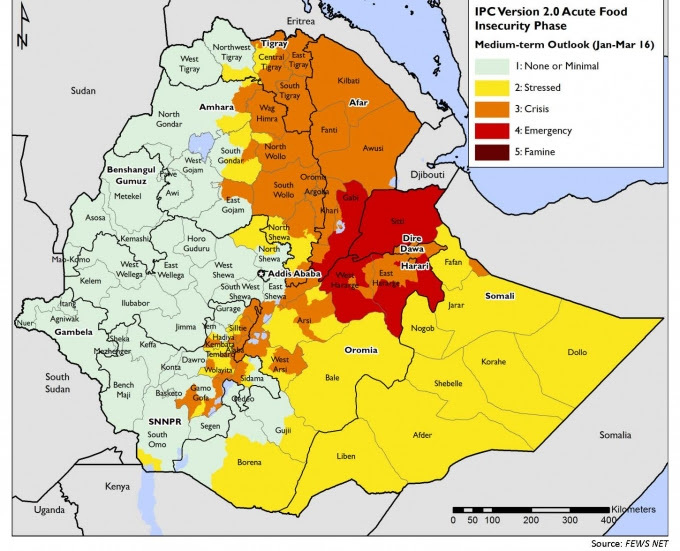 Embedded within the mixed-messages for help is the fact that Ethiopia is by all accounts more prepared to deal with drought than 30 years ago. But Ethiopia’s greatest challenge is that 2015 was a tumultuous year riddled with humanitarian crises. The harsh reality is that this time Ethiopia is competing for international funds against the migrant crises of war-torn Syria and Yemen. The geography of drought and famine, 2016. On December 17, 2015, Marie-Claude Bibeau, Minister of International Development and La Francophonie, announced a commitment of $30 million in emergency humanitarian assistance funding to be distributed through several partners in response to the food security crisis in Ethiopia. In light of a rapidly deteriorating situation, Canada has pledged the allocation of a bulk of the funds through the United Nations World Food Programme ($21.5 million), followed by UNICEF at $2.5 million. The remainder of the funds have been pledged to NGOs such as CARE Canada ($1.9 million), Concern WorldWide ($1.6 million), World Vision Canada ($1.25 million) and Doctors Without Borders Canada ($1.25 million). Canada was reportedly the 5th largest contributor of aid in Ethiopia in 2015, a tradition of support dating back to 1984. With headlines made by the engagement of ordinary Canadians during the 1984 crisis and the considerable subsequent efforts of the federal government, it is no wonder that 1984 becomes the modern parable for African famine. For within Canadian consciousness, 1984 continues to serve as the last harbinger of hope, a hope that was the impetus to mobilize many across the world into action to create what they trusted was positive and permanent change. That history resonates in today’s response to Ethiopia’s plight, and especially within the rhetoric of aid and critiques of the Ethiopian government. However, we have yet to witness if the example of the past will be equally influential in mobilizing a new generation of Canadians in support of Ethiopia, in something akin to a Northern Lights 2.0. Nassisse Solomon is pursuing her doctoral degree in History and Migration and Ethnic Relations at Western University. Her dissertation, supervised by Stephanie Bangarth, examines perceptions of Ethiopians and Ethiopia in twentieth-century Canada. Letter to Ontario Premier David Peterson, from Carol Vaughan of the Guelph African (famine relief) Network. July 14, 1986. Found in file folder for “Relief Organizations and Canadian Assistance”, David Macdonald Collection R12287-229-9, LAC. Ken McQueen, “David MacDonald Excited By Challenge in Ethiopia,” Ottawa Citizen (December 11, 1984). David MacDonald Media Clippings File, #219-4, David MacDonald Collection, LAC. George McIntyre, “Famine in Africa is Still Real”. The Province, found in File Folder: Bowden’s Prints, Feb-April 1986. Volume 219- File 1. David MacDonald Collection, Box # R12287, LAC. Brian Jefferies, “Dateline Nairobi: African Tragedy”. Maclean’s, August 4, 1980:8. Mike Crawley, “So Little To Eat: More Than 11 Million Are facing Starvation”. Macleans, March 17, 2003:25. 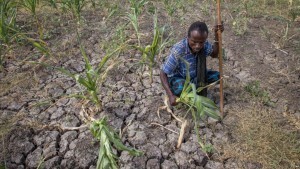 Canadian Press, “Act before thousands starve, Geldolf Says of Ethiopia Tour”. The Vancouver Sun, 21 Dec 1987: C5. Lisa Keller. “Civil Strife Keeps food aid from starving in Ethiopia”. The Vancouver Sun, May 7, 1988: A7.